We’ve sourced the web to bring you a few of the last and most luxurious ivory chess sets that still exist in 2019. Ivory Chess Sets are something that many people would like to have in their homes, but most don’t realize that they’re still within reach. Increasingly strict laws regarding the sale of ivory fool people into thinking that the days of being able to own a beautiful ivory chess set of their own are long gone, but that’s actually not the case at all. The trick to buying legal ivory products is to consider the source of the material. As of 2019, there is still a loophole that allows for a readily available source of legal ivory – though it is extremely limited and dwindling all the time. What is this source of legal ivory? 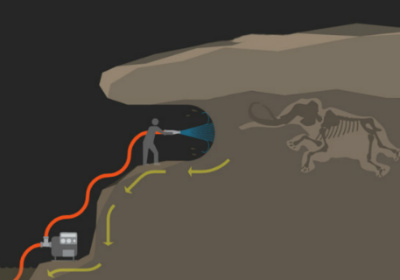 It exists in the skeletons of ancient wooly mammoths, who became extinct over 40,000 years ago. Now you can see why the resource is so limited! An unknown but limited number of these skeletons lie under the Siberian permafrost, just waiting to be unearthed and turned into a beautiful bone chess set for buyers with luxury tastes. Wooly mammoth ivory is still legal in most US states, though some are working up legislation to ban its sale. California is the one state that’s managed to pass this legislation, though several other states have proposed it. If you live in Alaska, though, you’re in luck- lawmakers there have explicitly exempted wooly mammoth ivory from the existing bans on modern ivory. You’ll need to check your local laws to be sure before buying. Due to the uncertain future of legal ivory, we recommend you buy your set as soon as possible to avoid any possible legal complications. Ivory of any type is a rare and luxurious material. Ancient wooly mammoth ivory is an even rarer resource because only a certain amount exists to be uncovered, and once it’s gone, it’s gone. Because of this extreme rarity, these products do come at a premium price point. These luxury bone chess sets are available exclusively for those with deep enough pockets to finance them- unfortunately there is simply no such thing as a “budget” ivory chess set. Any Real Mammoth Ivory Chess Set will cost upwards of several thousand dollars. 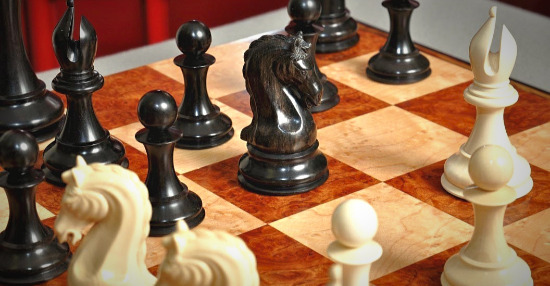 This chess set is, of course, made from mammoth ivory. It is extremely rare and luxurious – the single most high-end chess set on our website. In fact, we wouldn’t be surprised if this was named as the best ivory chess set on the market today. It also has a price tag befitting its quality. This set comes with a certificate of authenticity that proves it is made from exclusively legally sourced ancient mammoth ivory, as well as an engraved registered plaque and an individual production number. Each one of these sets is made on a completely bespoke basis, meaning that when you order This Antique Ivory Chess Set, it is custom made for you, to your exact specifications, and then dispatched. Because of this, each set is 100% unique, as is the nature of all handmade items. All 34 chessmen included in this rare chess set are hand-carved from sleek mammoth ivory. White’s army is left the natural color of the ivory, while a dark lacquer is applied to Black’s army in order to provide the perfect amount of striking contrast between the two armies. Being carved from mammoth ivory, each piece is perfectly balanced without the need for any sort of artificial weighting system. This natural weightiness provides an unparalleled, natural feel in the hand while playing that is unmatched by chess sets made from any other material. The natural balance of ivory pieces is one of the top reasons that it is so highly sought after in chess sets, and you will not be disappointed with this set. The Ivory Chess Set includes a coffered chess box to keep your ivory chess pieces protected while they are not in use. With such a luxurious product as this, you’ll want to take every precaution to keep them in tip top shape, and the felt lined chess box with individual compartments for each chess piece provides a safe place to store these one of a kind pieces. Remember, the future legality of these sets is questionable, so you’ll want to keep yours in excellent condition since you may not be able to replace it! A chess board is not included with this hand carved ivory chess set, though you can easily add one to your order for a small fee. Including a Free Luxury Chess Box! This set is made by the same manufacturer as the previous set, though this one is available at a slightly more affordable price point. The Ivory & Genuine Ebony Chess Set also comes with the certificate of authenticity proving that it’s made from real wooly mammoth ivory, as well as an engraved registered plaque and an individual production number. These things help to reassure the buyer that everything is on the up and up regarding the source of the ivory, and they’re a hallmark of a reputable seller. We don’t recommend buying any ivory chess sets from a seller who doesn’t provide these things. 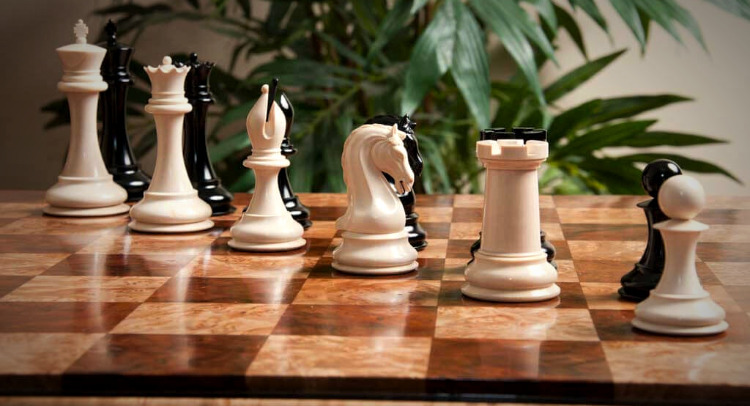 The chess pieces in this ivory set are hand carved by master artisans from the finest materials. They are modelled after the traditional shape and stature of the original Staunton pattern. White’s army is, of course, made from ancient wooly mammoth ivory, while Black’s pieces are carved from ebony wood. The ivory pieces are not weighted, but the ebony chess pieces are. There are 34 chessmen in all, including 4 Queens. The King is a towering 4.4 inches tall with a 2 inch diameter base. This ivory chess set offers a luxury product at a more affordable price than the full ivory set. 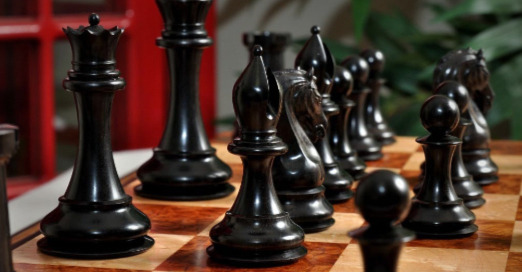 Most people will not even be able to tell the difference between the ebony chess set pieces and the ivory ones, since both sets of pieces are skillfully carved and gorgeously finished. The manufacturer does offer a warning regarding This Mammoth Ivory Chess Set. It is their belief that the sale of all ivory- including ancient wooly mammoth ivory will soon be banned by the United States government. Because of this, they recommend buying a mammoth ivory chess set sooner rather than later if you have your eye on one, because it is uncertain how long it will remain legal to do so. Our own research supports this theory, so buy now or you may not be able to buy at all! Ivory chess sets have been prized throughout human history for their beauty, rarity, and natural weightiness. Ivory chessmen are a joy to play with, and they feel smooth and balanced in the hand. 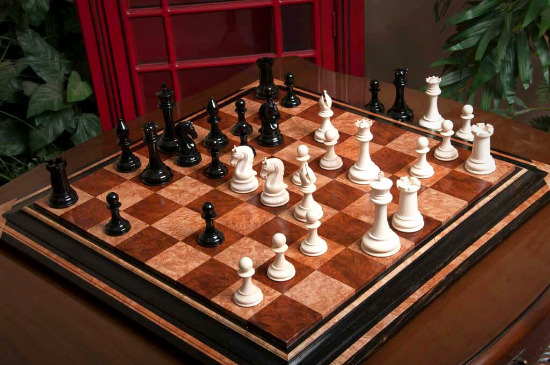 Ivory chess boards offer unmatched color, depth, and smoothness. For centuries, ivory trinkets, including chess board sets, were a highly valuable item and often served as luxurious gifts for important people- even royalty! Nowadays, however, public opinion on ivory has shifted quite dramatically. Of course, it is still prized for its looks and rarity, but the negative environmental impact of harvesting ivory outweighs its benefits for many people. This shift in thinking has also translated to the laws of many countries. Due to the increasing number of countries that are banning the sale of ivory, Ivory Chess Sets can be quite hard to come by. The trick is to not look for new products manufactured in 2019, but rather shift your focus to look for antique ivory chess sets and pre ban sets. This way, you can find a rare chess set for sale that’s been in circulation for years with ease instead of trying to find a loophole in the law. If you’re not interested in an antique chess set, however, there is still an option for you. Mammoth ivory chess sets are made from the bones of ancient wooly mammoths that have been dead for over 40,000 years. 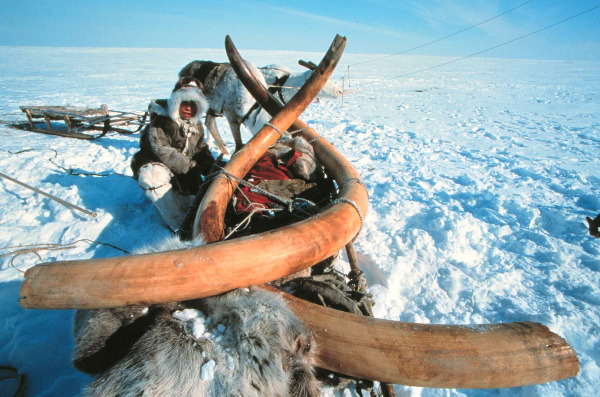 The ivory is harvested from mammoth remains that have been well preserved in the frozen Siberian landscape. Because no living animals are harmed due to the harvest of this type of ivory, it is perfectly legal to harvest and sell, and you can buy it without any legal trouble. It’s worth noting, however, that ancient mammoth ivory can be very difficult to distinguish from modern elephant ivory. Because of this, some bad actors and more dishonest sellers may try to pass off illegal elephant ivory as mammoth ivory. It’s important to always buy Ivory Chess Sets from a trusted and reputable seller to make sure that you’re really buying what you think you’re buying. We also wouldn’t recommend trying to travel with an ivory chess set or boarding an international flight, since airport security may not be able to distinguish one from the other without damaging your bone chess set, and you may end up in some hot water! It’s best to leave this set at home rather than risk being branded an ivory smuggler! Chess Set Reviews: Our List of the Best & Highest Quality Chess Sets on the Market. The Best Marble Chess Sets: Our List of Marble & Stone Chess Sets of the Best Quality. Isle of Lewis Chess Set Reviews: List of the Best Isle of Lewis Chess Sets of 2019. The Best Wooden Chess Set: List of the Best Wooden Chess Sets in 2019. Vintage Chess Set: List of the Best Antique Chess Sets of 2019. Dragon Chess Set: Review of the Best Dragon Chess Set for Sale. The Best Crystal Chess Sets: List of the Best Glass & Crystal Chess Sets of 2019. The Best Travel Chess Set: List of the Best Travel Chess Sets of 2019. Can you tell me roughly is my chess set old please and if so is it worth getting it insured. I can send you a photo. Thankyou. I have being told by a Rock Doctor ( Geologist ) that it looks Marble to him but they would have to do a Hardness Test to make sure. I have a number of photos that I can send. what I would like to know and approx Price to see if I will keep it or have special insurance done. I think it would be the best if you send the photos of your chess set to an antique chess sets expert for pricing. Try antique chess shops like chessantiques(dot)com or antiquechessshop(dot)com. Sorry that I can’t help you myself though.